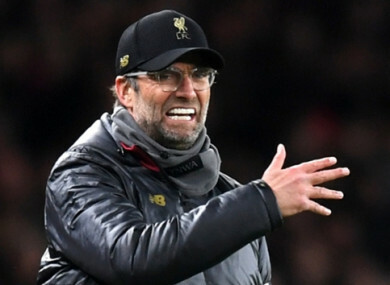 LIVERPOOL BOSS JURGEN Klopp has warned his side to expect a ‘thunderstorm’ when they meet Manchester City in tonight’s crunch Premier League clash. Liverpool held a healthy 3-0 first-leg lead over City the last time they visited the Etihad Stadium, in the second leg of their Champions League quarter final clash – a match the visitors went onto win 2-1. Klopp admits that he was well aware of the danger the hosts could cause, with Gabriel Jesus having opened the scoring after just two minutes to put the Reds under pressure. “It was a thunderstorm,” the German said of that night in April. “They said before the game they could come back from 3-0 down and everyone knew they could – we did as well. “I think we should [prepare for another thunderstorm]. It will be a very intense game; it’s unbelievable how obvious their desire is. As mentioned, the Reds could count themselves lucky not to have lost the reverse fixture at Anfield as Riyad Mahrez blazed his late penalty over the bar, but Klopp feels that luck is required to win titles. “You can’t go unbeaten so far if you don’t have luck,” he said. “You need luck. “We have had much in the years before and not much this season, but we had these moments when Mahrez missed the penalty and then there was the goal we scored against Everton. “But I would say that even then we desered to win against Everton and we deserved the point against Man City – and that’s because of the consistency in the performances so far. Email “Leading Liverpool should be ready for a 'thunderstorm' at Man City, says Klopp”. Feedback on “Leading Liverpool should be ready for a 'thunderstorm' at Man City, says Klopp”.